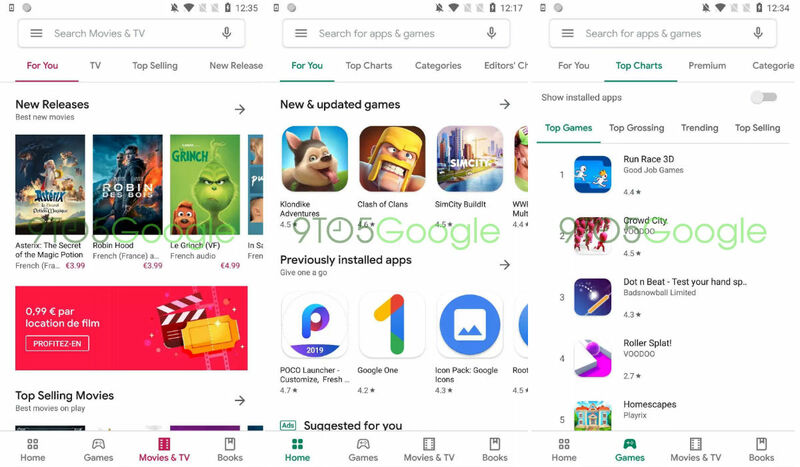 It appears that Google Play will soon be getting the all-white theme treatment from Google, same as many other Google applications in recent history. Not only that, but recently spotted code hints at Google Play-initiated system updates, too. On the surface of this new white theme, with most of the app’s color being removed, it doesn’t look ideal. To be honest, it looks kinda boring and overly clean to my eye. However, the simplifying of these apps’ themes points to one thing: Dark Mode. And because we know white themes aren’t great for a phone’s battery life, that only reinforces my belief that Dark Mode is coming for all of these apps. And when and if that happens, oh my, it will be glorious. In the above images posted by 9to5 Google, we can see mostly everything has gone from a little color, to no color at all. Instead of the top portion of the app featuring the color associated with the section of the app you’re in (red for movies, green for apps, etc. ), it’s now all white except for the colored text that will indicate which section you’re in. In line with its other redesigns, a bottom navigation bar is also in place for quickly navigating sections. System Updates from Google Play? According to code strings spotted in a recent Google Play teardown, Google may be experimenting with initiating system updates directly from Google Play. Basically, it’s the same thing as it being in the Settings menu on your phone, but instead it would be inside of Google Play. If you have a Mac computer, this isn’t the craziest idea ever. Apple ships out system updates right along app updates inside of its App Store, so possibly in Google’s eyes, this experience would be more user-friendly. Google I/O is coming right up, but it’s unclear if Google intends to announce any of these changes at that time. I suppose we’ll have to wait and see.